Reception: Sunday, November 11, 2:00-4:00 pm. Free Event. Join us for refreshments and enjoy meeting our talented Featured Artist. November and December will be the perfect time to visit the Village Gallery of Arts to find the most beautiful and creative Holiday gifts and ornaments! Kalyani Pattani, Featured Artist. Kalyani’s artwork is mainly a way to interpret her inspiration and transform her thoughts and ideas to art on canvas, paper, or in clay sculptures. Nature’s forms and shapes inspire and influence her artwork and she is fascinated with bright colors and textures. Congratulations to our OCTOBER AWARD SHOW WINNERS! If you enjoy observing birds, bees and flowers, this class is for you. Explore basic watercolor techniques while painting beautiful subjects from the garden. Instructor, Mary Burgess, includes informative exercises and lessons in each class while allowing time for individual paintings and plenty of individual attention. Write your thoughts beautifully! We will learn Italic Script, starting from the beginning. Whether you have never held a calligraphy pen, or if you have done calligraphy in the past and need a refresher, this is an opportunity to hone your skills. Think of the beautiful greeting cards you will create! 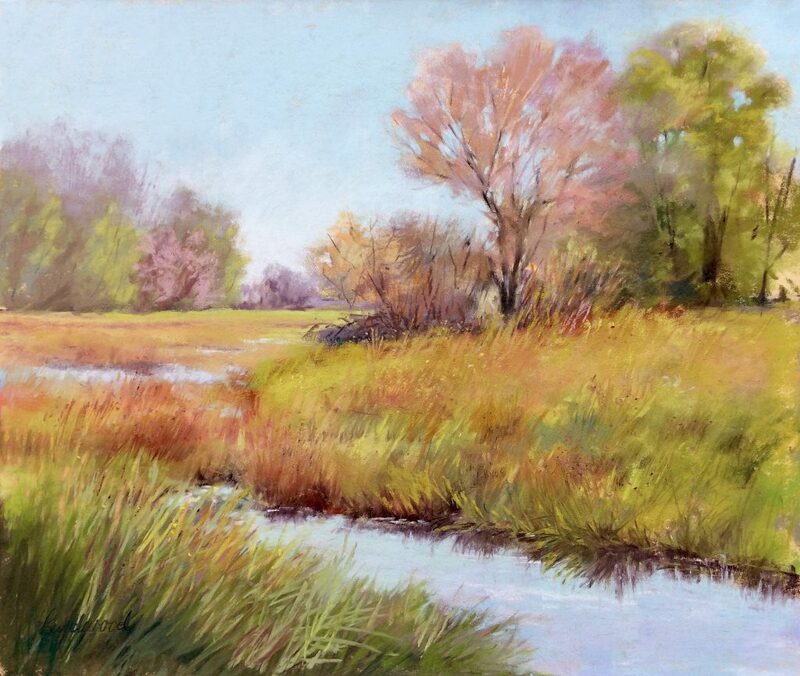 This class is for beginning and intermediate pastellists, working with soft pastels only. Lessons will focus on choosing pastel papers and textures, underpainting methods, the color wheel, working with warm and cool colors, using various pastel strokes, and choosing your subject. Students will experiment with different pastel strokes while applying the principals of color, value and design. Explore this fascinating Japanese paper marbling technique using water-based boku inks floated on plain tap water in a shallow tray. The name suminagashi literally means spilled ink. Learn how to create intricate marbled papers using sumi inks dropped from small paintbrushes into a tray of water and printed on rice paper. Patterns and special colorful effects are achieved using a bamboo stylus and eyedroppers. This process is meditative, mesmerizing, and creates subtle, found-in-nature patterns and rings that are one-of-a-kind. We will create dozens of marbled rice papers which can be later used to collage onto heavier paper and developed further. MEMBERS ONLY CLASSES/WORKSHOPS—Become a member NOW and join us for this fun holiday class! MEMBERS are invited to make a felted gnome to donate to our December Ornament Fundraiser! Learn how to create a basic body shape, add a hat, nose, beard and shoes to create a felted Christmas ornament perfect to hang on a tree. These will be for sale in the gallery during the month of December.